Just 40-minutes away from Sayre Mansion is Crystal Cave Park, a unique outdoor attraction. Explore a cave with walls that glitter with hundreds of crystals. This is the perfect stop for families traveling with small children or anyone interested in geology. The site also has an ice cream parlor, fast food restaurant, miniature golf course, and museum. 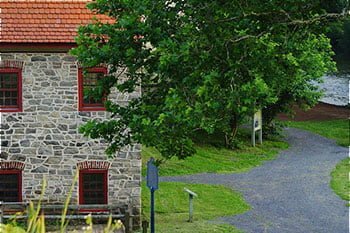 There’s so much to do at Crystal Cave, PA! Are you looking for other attractions near Crystal Cave, PA? Download our free Vacation Guide! We’ve listed our favorite restaurants, museums, and golf courses in Bethlehem and beyond. It’s never been easier to plan your stay at Sayre Mansion. Located in the heart of Pennsylvania Dutch country, Crystal Cave was discovered in 19871 by Gideon Merkel and John Gehret. Upon exploration, they discovered the walls of the cave were adorned with diamond-like crystals. Thus, Crystal Cave was named! In 1872, Samuel D.F. Koehler bought the cave and began charging admission. Crystal Cave was Pennsylvania’s first “show cave” and has since become an incredibly popular spot for visitors to explore! The best way to explore the cave is by taking the Educational Underground Tour. It lasts 55 minutes and includes a short film presenting the cave’s history. You’ll follow Crystal Cave Park’s knowledgeable guides through an array of milky white stalactites, stalagmites, and pillar and dripstone formations. You’ll also see incredible examples of stone sculptures, including the Cathedral Chamber, the Prairie Dogs, the Giant’s Tooth, and much more. The tour tickets are just $14.50 for adults. The cave is open daily from the beginning of March to the end of November, so definitely visit this attraction during your next stay at Sayre Mansion. Once you’ve explored the cave, visit the Ice Cream Parlor and Crystal Cave Cafe! The cafe and parlor are open daily in July and August, and weekend in June and September. The restaurants offer a variety of fast food and Dutch specialties, as well as ice cream cones, sundaes, and Dutch treats. If you’re in the mood for a little competition, play a round of miniature golf at the course, which is open seasonally. 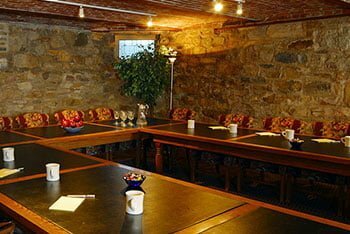 Once you’re done with your adventure at Crystal Cave, PA, return to our beautiful, historic mansion. 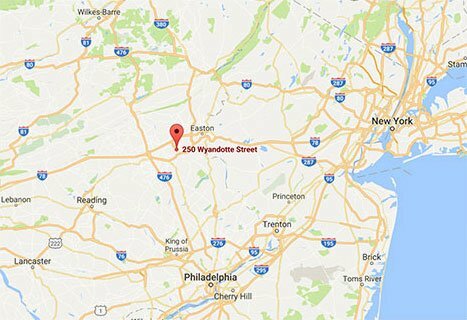 We are located in the heart of downtown Bethlehem, just steps away from Lehigh University and the Steel Stacks Performing Arts Center. 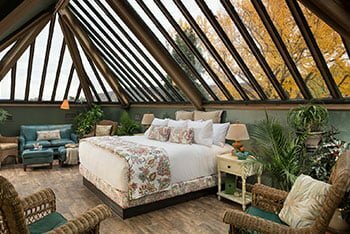 Our beautiful and unique accommodations are the perfect way to spend a night. Take a look at The Hayloft in the Carriage House. This beautiful suite, located in the third-floor loft of the Carriage House, features dormered ceilings as well as furniture and accessories adorned in soft shades of straws and green. The room’s tree-top setting provides amazing views of the “Star of Bethlehem” on South Mountain Street and the Lehigh Campus on the hillside. The living room features overstuffed chairs and a daybed to sleep a third person, as well as a flat-screen TV. The bedroom features a king bed and an additional flat-screen TV. The bathroom offers a deluxe, glass-tiled walk-in shower. Contact us with any questions and to make your reservation today! We look forward to having you.